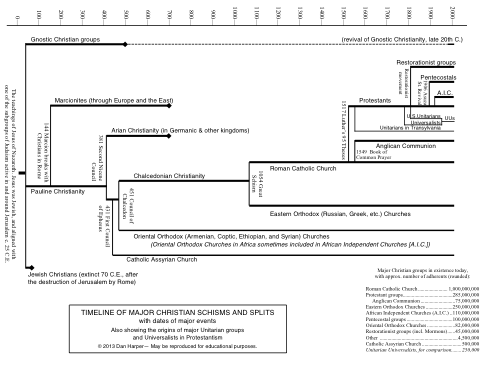 I know that your “phylogenetic tree” of Christianity was focused primarily on Christianity. However, it’s probably not accurate to represent Judaism as a monolithic single line stretching from 2000 years ago to the present. There is some speculation that Jesus was part of the Pharisaical Jewish movement that was in opposition to the Sadducees and the Temple Jewish movement. The harsh statements about the Pharisees attributed to Jesus may have originally reflected an internal dispute with this movement. And the Rabbinic form eventually gave rise to Reform Judaism, Conservative Judaism, and Orthodox Judaism — and perhaps Ethical Culture Society. Ethical Culture has some similarities to UU — it grew out of an existing religious movement (Reform Judaism for Ethical Culture and Protestant Christianity for UU) and both were influenced by transcendentalism and humanism in the 19th and 20th centuries. Thanks, Steve. Good thought, and now I have to figure out what to do with it. On the one hand, it’s tempting to leave Judaism off completely. On the other hand, it’s tempting to show where Christianity came from (i.e., Jesus was Jewish). On the third hand, Judaism went through the transition from Temple-based Judaism to rabbinic Judaism during the era when Christinaity took off — do I show that, or not? This will require some thought…. Nice chart, just thought I’d point out the spelling error in “Roman Chatholics” before you copied it a hundred times or something. Thanks for catching that, KTF, the revised version will be corrected.